It was estimated the person jumped from the 16th or 17th floor of the 24-floor tower. London: Sajad Jamalvatan was at the movies Tuesday night when he got a call from his panicked mother. Come home quickly, she begged. "The building is on fire!" she said. A few minutes later, the 22-year-old biomedical engineering student rounded the corner to see Grenfell Tower transforming into an inferno. "As soon as I arrived, someone pointed and said, 'Someone is jumping! Someone is jumping!'" he recounted on Wednesday with the smell of smoke lingering in the air. He estimated the person jumped from the 16th or 17th floor of the 24-floor tower. That kind of fall is not the kind you can survive. The number of dead touched at least 12 - with dozens more injured and authorities warning the death toll could rise. Witnesses recalled a mother dropping her baby off a balcony and young children banging frantically on windows before disappearing behind a thick blanket of smoke. "Seeing people die in front of you . . ." he said as his voice trailed off and he stared hard at the sidewalk. He said the blaze had advanced quickly, and that the alarms did not appear to have been triggered. "When I arrived, there were 10 flats on fire. After that, the whole building was on fire," he said. He snapped his fingers. "It went like that," he said. 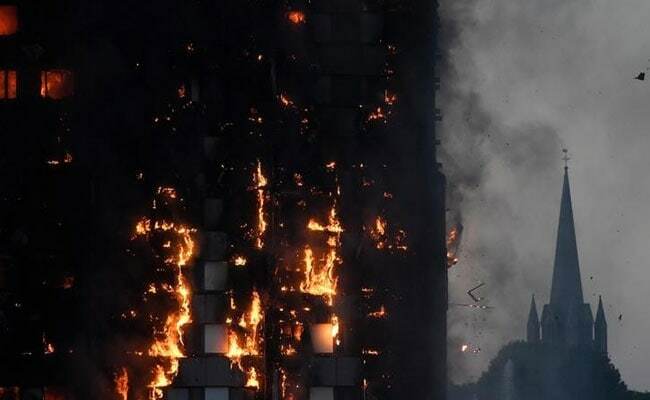 Accounts such as his quickly added to suspicions that the material used in the 24-story building could have contributed to the fast-moving blaze at an enclave of modest-priced units in one of Britain's richest neighborhoods. The residents' association from the tower block had previously warned the tower was a potential fire risk - they highlighted their concerns in a blog post last year - and there was palpable anger on the streets that more could have been done to prevent the fire. Some complained the fire alarms didn't work properly. Others said the staircase in the middle of the building was inadequate. Still others claimed that those who managed the building did things on the cheap. The London Fire Brigade called the fire "unprecedented," and said an investigation was underway. At a nearby community center, meanwhile, hundreds gathered in hopes of locating missing friends and relatives - including some Muslim residents who were gathered for the evening meals during the holy month of Ramadan. Concerned locals also arrived in droves, many carrying plastic shopping bags sagging with food, diapers, toiletries and blankets. One man pushed a baby stroller teetering with water, milk and cans of baked beans. Ahmed Chellat, 60, a retired community worker, was at a community center looking for his brother-in-law, his wife, and their three children who lived on the 21st floor of the tower. He said he spoke to his brother-in-law's wife at 1:45 a.m. and that she was told to stay put. When he asked her why they weren't instead rushing out of the building, she told him: "They are telling us to stay in - they asking us to cover doors with towels. But fire is coming heavily," he recalled. When he called back 30 minutes later, "the last thing she said was. 'Smoke was coming heavily into flat.'" "If the emergency services tell them to stay inside, it means you are coming to get them. Did they? These are big questions," he said. Many residents said the building had recently been refurbished and fitted with plastic panels that they believed helped the fire to spread quickly. "You could hear it cracking. Hear it flying. If it was brick it would not have caught fire as quickly," said Chellat. In similar fires elsewhere around the world, flammable exterior cladding has been blamed for several rapid fires at high-rises - including several blazes among Dubai's many skyscrapers. Just before New Year's celebrations to welcome 2016, a fire raced through the 63-story Address hotel in Dubai as millions of people watched television coverage of the festivities at the nearby Burj Khalifa, the world's tallest building. A handful of people suffered injuries in the fire. In January, Dubai civil defense authorities ordered new fire safety regulations that include fire-resistant cladding and other measures. Mohamed Bouye, a 44-year-old manager, was touring the local community centers in London trying to find his friend from the 18th floor of the tower. "No word, no answer. So yeah . . ." he said, as police began putting up a security cordon next to him. He watched the fire burn throughout the night. When he first arrived at the tower, shortly after 1 a.m., it looked as if the fire could be contained to one section of the building. He said he even saw one man casually leaning over the railing of the building, like there was no imminent danger. But things changed quickly. "The flames went from the 9th floor to the 27th floor in 10 minutes," he said. "There were then screams. 'Help us!' I saw two people jump, two bodies flying down, they were between floors 10 and 15. Other people told me they saw people jumping from the other side of the building." Christine Umeh, 35, was woken up at about 3 a.m. by the whirring of helicopters, which continued on throughout the day on Wednesday. When she looked outside of her building, which faces the tower, saw helpless residents on the top floors flicking their lights on and off, on and off. "It's like they were saying, 'Just help me. I'm here. Try to help me,'" she said, as she pushed her 21-month-old daughter back-and-forth in her stroller. "It was like an SOS signal."